Given the location, it's probably more of a dusty gust than a big wave, but there's certainly a fair few really terrific crime novels set in rural Australia that have come out in recent years. This recent release was mentioned to me by one of the best antipodean reviewers in the business, Karen Chisholm, when we were chatting about the rise of Southern Cross Crime (Australian and New Zealand crime writing) and the fresh blood that was coming through and bolstering the ranks. 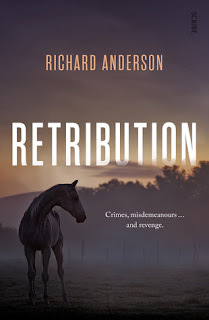 Unsurprisingly, given he's a second-generation cattle farmer himself, Anderson brings a real sense of authenticity to the small-town characters and setting of RETRIBUTION. There are some really interesting characters, a good mix of personalities and viewpoints on various farmland and rural issues, and just little touches here and there which add texture. Whether it be about crops or horsemanship other things, Anderson weaves information in without overwhelming with details. RETRIBUTION is also interesting in that it's not centred on a murder mystery (sorry, belated spoiler alert) but kicked into gear by a variety of other tensions and nefarious deeds. All very fitting for the characters and place. The quartet of characters at the heart of the tale are an interesting grouping: a farming thief with close ties to the land, a protestor-for-hire who enjoys creating chaos, a middle-aged woman who's gone from political powerhouse to pariah, and a young woman who wants more - though she's just not quite sure what. Each feels very real and rounded, growing in depth over the course of the novel, and the interactions between them and others aren't typical or cliched. Overall, I thoroughly enjoyed reading Anderson's take on a rural crime tale. RETRIBUTION is full of interesting texture, fresh characters, authentic rural issues, and an absorbing storyline.